Sarah Nader- snader@shawmedia.com Woodstock North's Hakey Ahr dribbles down court during the third quarter of Tuesday's Class 3A Regional against Richmond-Burton February 17, 2015. North defeated Richmond-Burton, 56-46. Sarah Nader- snader@shawmedia.com Richmond-Burton's Allie Hogan (left) and Woodstock North's Ashley Jones try to grab the rebound during the first quarter of Tuesday's Class 3A Regional February 17, 2015. North defeated Richmond-Burton, 56-46. 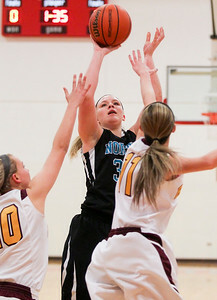 Sarah Nader- snader@shawmedia.com Woodstock North's Haley Ahr shoots during the second quarter of Tuesday's Class 3A Regional against Richmond-Burton February 17, 2015. 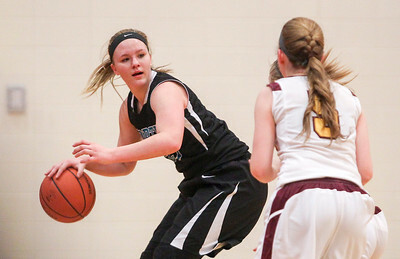 North defeated Richmond-Burton, 56-46. 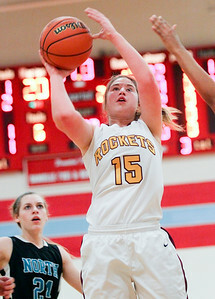 Sarah Nader- snader@shawmedia.com Richmond-Burton's Jessica Guenther shoots during the second quarter of Tuesday's Class 3A Regional against Woodstock North February 17, 2015. North defeated Richmond-Burton, 56-46. Richmond-Burton's Allie Hogan (left) and Woodstock North's Ashley Jones try to grab the rebound during the first quarter of Tuesday's Class 3A Regional February 17, 2015. 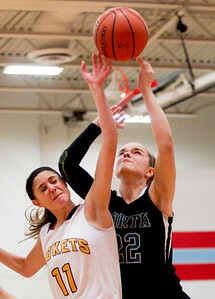 North defeated Richmond-Burton, 56-46.